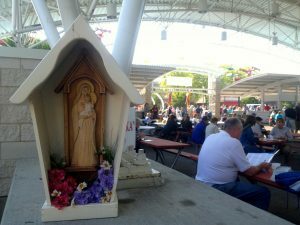 Milwaukee’s first Polish Fest was a four day event held in 1982 over Labor Day weekend on the city’s Summerfest grounds. Organized on a shoestring by Conrad Kaminski and Adrian Choinski but with the enthusiastic involvement of hundreds of volunteers, it and the 1983 Polish Fest that followed were enormous successes, attracting nearly 50,000 patrons each year and generating over $300,000 in proceeds. With these funds the Festival’s organizers proposed that a permanent Polish community and cultural center be established. After lengthy discussion, followed by years of hard work and continual fundraising, an elegant edifice, erected on a pristine lake in the city of Franklin southwest of Milwaukee and styled after a 17th century Polish manor house, was built and dedicated in August 2000. 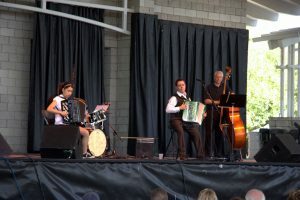 Polish Fest offers a rich variety of music provided by America’s leading polka bands, rock and contemporary stars from Poland, along with performances of the Polish classics, and plenty of dance opportunities. A top Polish Fest priority, as always, is the presentation of informative, imaginative, and highly professional displays of Polish culture for those attending. Polish foods and activities for children are very important festival features, as is the Sunday Catholic Mass, usually celebrated by a bishop of Polish heritage. Despite the usual weather-related challenges facing all outdoor festivals, Polish Fest—now a three-day event in June and led by such community activists as Judge Michael Skwierawski, Marty Kmiec, Janet Branden, and Janine Adamczyk—remains one of Milwaukee’s major volunteer-based lakefront ethnic summer attractions. ^ Donald E. Pienkos, “Old and New: Celebrating Wisconsin’s Polish Legacy,” The World and I (June 1999): 200-207. ^ “History,” Polish Center of Wisconsin, accessed June 12, 2015. ^ The June 15, 2011 Milwaukee Journal Sentinel provides a typical description of the programming at Polish Fest. See See Kathy Flanigan, “Polish Fest to Celebrate 30th Year in Milwaukee,” Milwaukee Journal Sentinel, June 15, 2011, last accessed April 10, 2017. Pienkos, Donald E. “Old and New: Celebrating Wisconsin’s Polish Legacy.” The World and I (June 1999): 200-207.